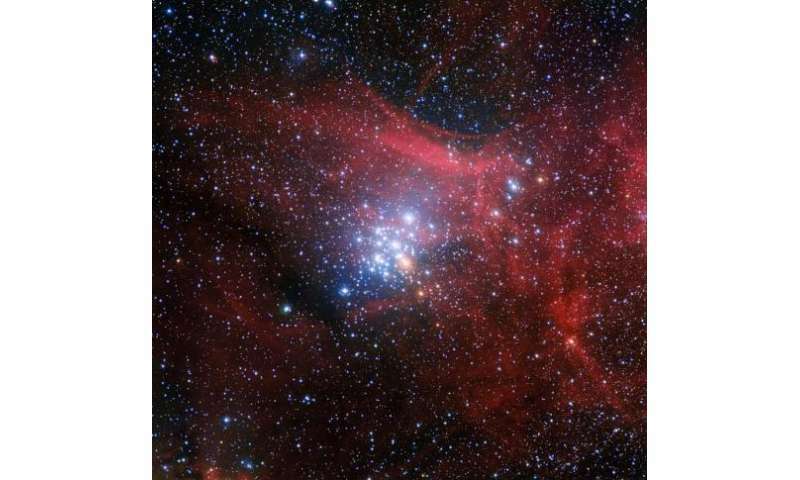 Most of the stars seen here are very young, and the cluster itself is less than 10 million years old. Just babies on cosmic scales if you consider that the Sun is 4.6 billion years old and still only middle-aged. An abundance of these bright, blue, youthful stars is common in open clusters like NGC 3293, and, for example, in the better known Kappa Crucis cluster, otherwise known as the Jewel Box or NGC 4755. These open clusters each formed from a giant cloud of molecular gas and their stars are held together by their mutual gravitational attraction. But these forces are not enough to hold a cluster together against close encounters with other clusters and clouds of gas as the cluster's own gas and dust dissipates. So, open clusters will only last a few hundred million years, unlike their big cousins, the globular clusters, which can survive for billions of years, and hold on to far more stars. Despite some evidence suggesting that there is still some ongoing star formation in NGC 3293, it is thought that most, if not all, of the nearly fifty stars in this cluster were born in one single event. But even though these stars are all the same age, they do not all have the dazzling appearance of a star in its infancy; some of them look positively elderly, giving astronomers the chance to explore how and why stars evolve at different speeds. Take the bright orange star at the bottom right of the cluster. This huge star, a red giant, would have been born as one of the biggest and most luminous of its litter, but bright stars burn out fast. As the star used up the fuel at its core its internal dynamics changed and it began to swell and cool, becoming the red giant we now observe. Red giants are reaching the end of their life cycle, but this red giant's sister stars are still in what is known as the pre-main-sequence—the period before the long, stable, middle period in a star's life. We see these stars in the prime of their life as hot, bright and white against the red and dusty background.